I was wondering if The Subjects have any thoughts – or visual responses – on one of my favourite images – Goya’s The Sleep of Reason Produces Monsters. 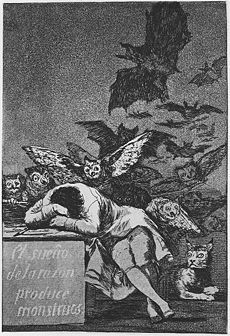 Francisco Goya, El sueño de la razón produce monstruos/The Sleep of Reason produces Monsters. Goya is a genius, with his art telling stories through his mark making and imagery. With his use of the dichotomy of light and dark, he was always searching for the truth no matter how ugly it was. The Sleep of Reason is really a great analogy for what happens when we dream – our subconscious unravelling. This body of prints, Los Caprichos (caprices or follies) is exquisite – and was used as propaganda during the Enlightenment. Whenever I see that picture, I’m reminded of the cover of Kate Bush’s third album, Never Forever. The two images speak very strongly (to me, anyway) to the approaches people and cultures have to the notion of “reason”. They’re obviously very different to each other. Goya’s take is that reason is sufficient to dispel monsters. Never Forever, on the other hand, celebrates the monsters: compare Goya’s dark, threatened self-portrait with the portrayal of Kate Bush barefoot, almost celebratory, as they emerge from under her sky-patterned dress. You could argue that the different approaches are not just gendered, but that there’s a correlation between particular body parts and reason/un-reason, but I reckon that would be going too far. Suffice it to say that there are many approaches to various states of mind, and that we should celebrate the difference.